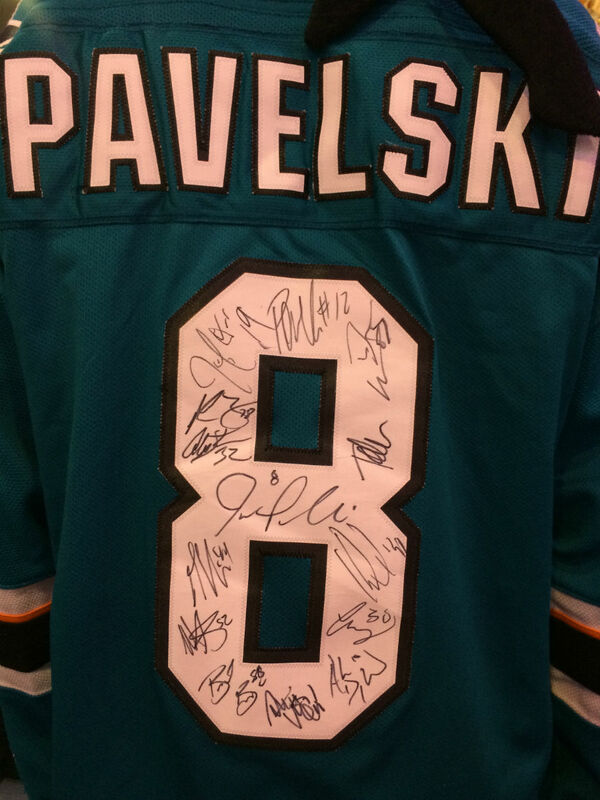 Ryan’s Joe Pavelski jersey, newly modified. If we’re lucky, we all get a few magical, red-letter days. We’ve had the good fortune to experience a few of those with Ryan over the last several years, and many have been documented on this blog. Trying to repeat the experience can be tricky. The reasons why are obvious: part of what made the original experience so exceptional is its uniqueness and rarity. Meaning both that it might be difficult to repeat and, if it isn’t, the original experience might somehow be cheapened. Ryan’s favorite team, the San Jose Sharks, just finished their once-annual swing through the northeast. It was on this trip last year that Ryan had the opportunity to meet the team, thanks to the efforts of a friend who works there and the generosity of the players and the public-relations staff. With the team in town to play the Devils on Saturday and the Rangers on Sunday, we had long-planned to attend both games. I wasn’t planning on any extra curriculars this time. But last week I heard from my friend, who was putting the wheels in motion for another visit. And so it was that Ryan and I found ourselves driving the Prudential Center early Saturday for the Sharks’ morning skate. He was dressed in his Joe Pavelski teal jersey, having already filled his Joe Thornton model with autographs last year. We picked up passes at the staff entrance and made our way into the mostly empty arena bowl to watch practice. The team’s radio announcer, Dan Rusanowsky, there among the gathered media to make notes for that night’s game, stopped by to say hello. He went out of his way to greet Ryan last year in Philadelphia and did the same this time. 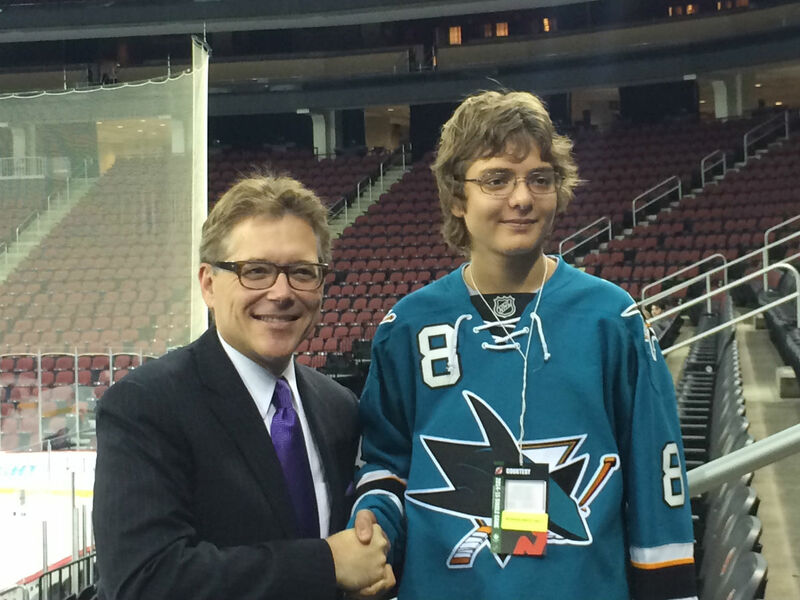 He quizzed Ryan about his favorite players and the times he had seen the Sharks play. I resisted my urge (I’m still working on it) to facilitate the conversation. Ryan didn’t need my help. He spoke easily with Rusanowsky, asking him about a player who was no longer with the Sharks and telling him about games we attended last year. Rusanowsky even asked for a picture with Ryan. Morning skates are brief, and after 30 minutes the players started heading off the ice. The team PR person suggested we make our way to the tunnel outside the Sharks’ dressing room. Ryan and I looked at all the equipment the team brings on the road — extra skate and stick blades, helmet parts, skate sharpeners, etc., while waiting for the players to finish dressing and exit the room. The first to emerge was forward Tommy Wingels. Ryan recognized him immediately. Wingels, in a pattern that would repeat, didn’t wait to be asked. He approached Ryan with a smile, a handshake and a warm greeting. He signed Ryan’s jersey and posed for a snapshot. 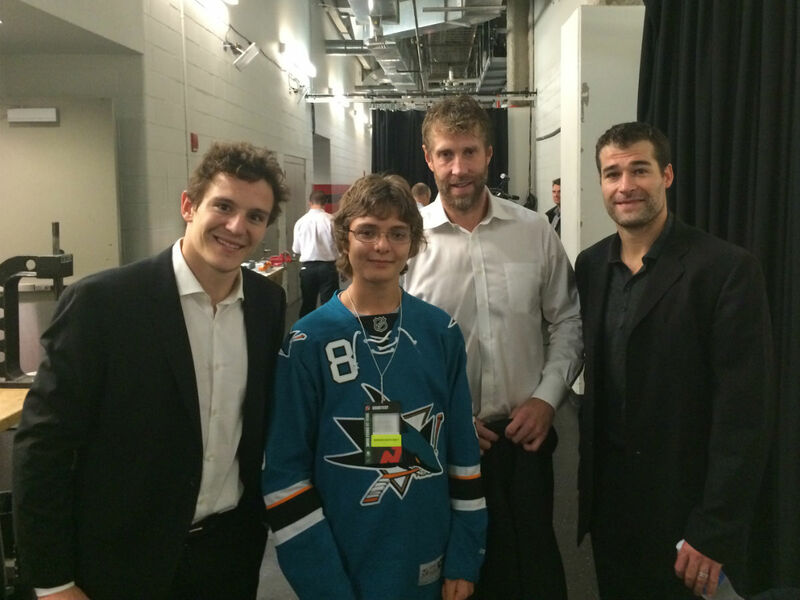 Next came Ryan’s favorite, Joe Thornton, along with long-time Sharks star Patrick Marleau. Once again, both approached and said hello. 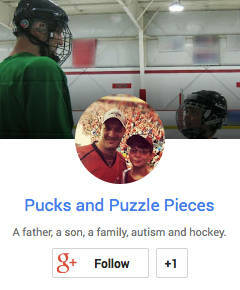 Marleau even addressed my son by name. I was flabbergasted. I think Ryan was as well. Marleau chatted with Ryan for a moment while others signed, and then he, Thornton and Wingels all posed with Ryan for a picture. Ryan and I laughed. Pavelski approached, signed, and posed for a picture, and then told Ryan “I saw you in the stands, thanks for coming out,” which only added to Ryan’s smile. 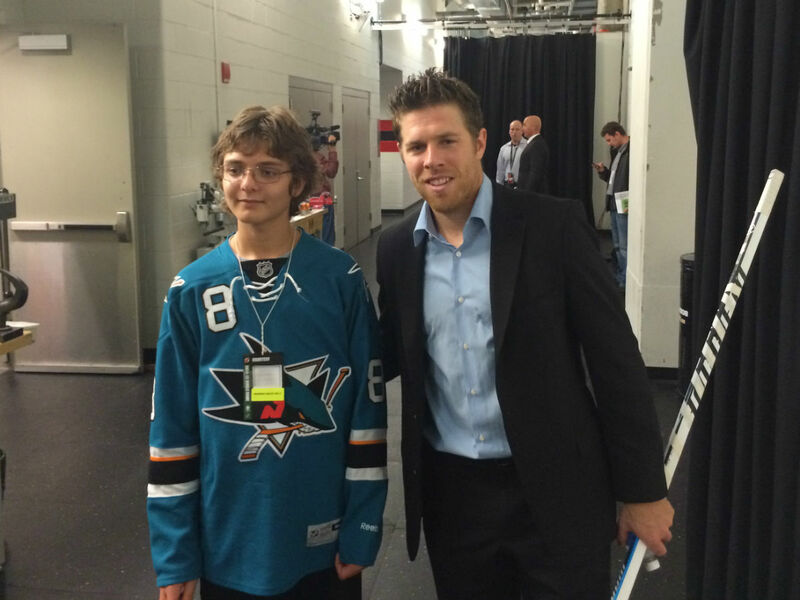 Ryan was complemented on his jersey choice by Joe Pavelski. Other players came out and the same scene repeated. The opposite of put out, each approached to offer a smile, a handshake, an autograph and to pose for a photo. In these interactions, I noticed the same thing I saw during that magical day in Philadelphia. Far from nervous or shy, Ryan was at absolute ease. He chatted comfortably with players. He complemented them on their performances in recent games. He even asked one player he didn’t recognize his name, and then quickly referenced something that player had done in a game a few days ago. I would have apologize to the player, but it was obvious he was not offended. As the last players walked past, we headed for home. We still had two Sharks games to attend. Saturday night (4-2 win vs. the Devils) went better than Sunday evening (4-0 loss to the Rangers), but really, any games I get to spend with Ryan are a win. 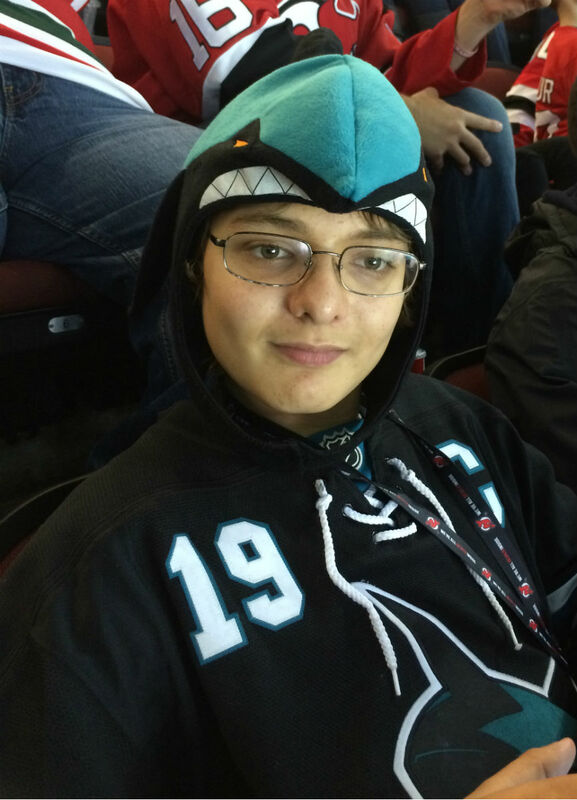 Ryan during the Sharks-Devils game Saturday night. And meeting the players — again? My son gains so much self-confidence from these opportunities. After we got home from the arena Saturday morning, he actually sent the picture of him with his favorite Sharks to two of his friends via text message. OK, so maybe we encouraged him to send it, but we weren’t responsible for what happened next. He spent the game Saturday night exchanging texts with both boys, one of whom was also there. They arranged to meet up after the first period. Sunday at Madison Square Garden, when the Rangers scored I looked at Ryan to gauge his reaction. He was already on his phone, sending a text to one of his friends. Ryan stayed positive throughout the game, even in the final moments of the loss. He kept cheering and never took off his Sharks head hat. He even won over what can be a tough Garden crowd, with several fans admiring his hat and his autographed jersey. Every time Ryan got a high-five from a stranger; when a Devils fan on Saturday night told him, incredulously, in the corridor “I see you here every game in a Devils jersey! ;” when we were stopped by some Rangers fans and asked to pose for a picture in Penn Station after the game Sunday — with each of those moments, I reminded Ryan that sports are social. With Ryan, still smiling despite the result, at Madison Square Garden on Sunday. “How often do you have conversations with or give high-fives to total strangers?” I asked. By now, it’s a question he’s used to but it’s a lesson I want to reinforce. Sports provides an obvious common context between groups of strangers that paves the pathway for easy social interaction. Sports are social. Period. Full-stop. 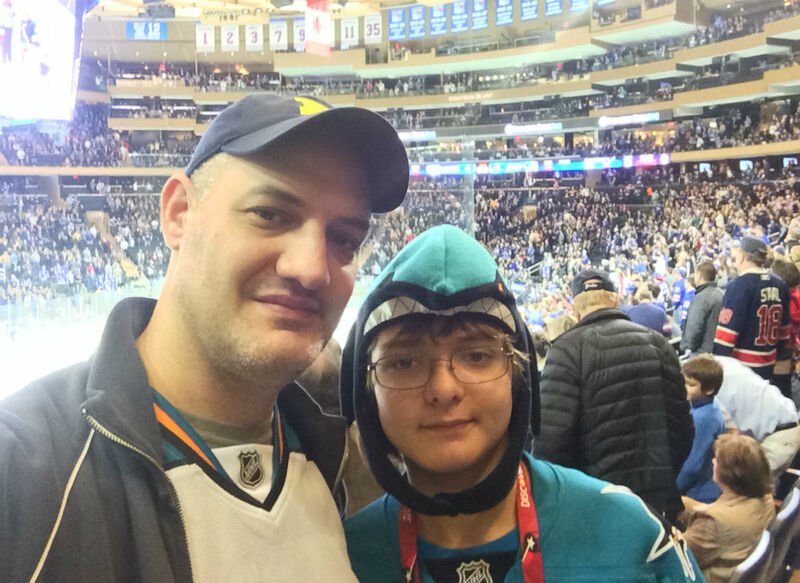 Our weekend with the Sharks ended with a 1-1 record, another autographed jersey, more memories for a lifetime, and for me, the repeated joy of seeing Ryan at his happiest, in his favorite environment, and among his people. Hockey people. And if you’ve been hanging around here, you know what I think of hockey people. We chased perfection, and we achieved it anyway. Ed Note: I would like to offer my sincere and heart-felt thanks to the San Jose Sharks organization, team management, public relations staff, players and coaches, for making Saturday morning possible. You are a credit to the NHL and the entire sport of hockey.